Is Ralph Tresvant Right? Can Money Really Not Buy You Love? This September has been filled with a bunch of rainy days. Rather than going out in a downpour, I kept to myself indoors with some activities like sleeping, studying, listening to music, and watching a ton of movies and TV shows. During this weekend, I was able to watch the new “Eight Days a Week”, “New Jacket City”, and “Mo’ Money”. These movies shared one common theme together. And, that was music. I always wanted to watch “New Jacket City” and “Mo’ Money” as their soundtracks included a few of my favorite artists like Johnny Gill, Janet Jackson, Ralph Tresvant, Christopher Williams, and others. The songs appearing on these soundtracks were heavily influenced by a popular genre of the late 80’s and early 90s called New Jack Swing, which I really love as it perfectly blends together different musical elements. Ralph Tresvant started his music career in the early 80s as a member of the “boys next door” R&B group New Edition. Labeled as the new Jackson 5, Tresvant was only 13 years old when the group released their first album entitled Candy Girl. The album’s lead single reached #1 on various music charts. The group released more hits as the group grew up by changing their sound from sweet, innocent R&B to adult-oriented new jack swing. The group initially broke up in 1990 to let the members pursue their own solo careers. However, they continue to reunite from time to time for special occasions, TV shows, and concerts. Billed as one of the leading vocalists for the group, Tresvant was all too ready to go solo when New Edition dissolved. There were rumors in the late 80s about the musician wanting to make his own music. However, the ambitions didn’t come into fruition until the success of Bobby Brown’s New Jack Swing-fused album Don’t Be Cruel in 1988 and the wildly popular New Edition album Heart Break. Knowing what to do, the musician released his self-titled album in 1990 with huge success. The album was #1 on the R&B charts and spawn a couple of hits. His follow-up album didn’t meet the same success as it reached #24 on the charts. “Money Can’t Buy You Love” was the fourth and last Top 10 single for the New Jack Swing singer. The song was in the 1992 Wayans Brother film Mo’ Money. The movie itself was critically panned by movie critics and actually bombed at the box office. 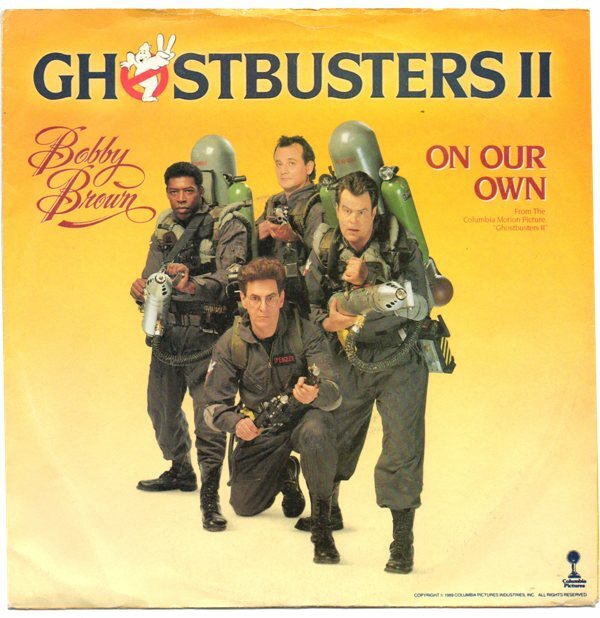 On the contrary, the soundtrack fared better as it reached #6 on the Billboard 200 chart. The soundtrack features a variety of splendid songs by Johnny Gill, Color Me Badd, Janet Jackson, Luther Vandross, and other well-known artists. Adam Greenberg from AllMusic.com gave a spot-on analysis of the soundtrack as it “is a perfect blend for a fan of the early-’90s R&B sound. Yet, the praises do fall short to a weak point with Greenberg mentioning that the soundtrack “doesn’t really meet the same standard as music of later years”. Tresvant’s tune is a true embodiment of the new jack swing style as it features elements of rap, hip-hop, jazz, R&B, funk, electronica, and a bit of dance. The song starts with the singer’s smooth vocals singing “Can’t Buy You” while a slick rap is placed over. The song leads into the first chorus which is my favorite part. The chorus is the meat of the song’s sandwich as it is well-crafted with an SP-1200 providing the hip-hop styled MIDI sequences, the beautiful electronic piano bits here and there, and Tresvant’s smooth background vocals (which are heaven-sent and sooooooooooo smooth that it is so wonderful). The lyrics are pretty satisfying as there is a strong message behind them. They were originally written with the idea of the movie’s theme of “money can’t buy can’t buy love” in mind Nevertheless, I feel like the message can apply to everyone and how they live their lives. Haven’t ever you thought about the issue deeply before? Is money REALLY THAT important in buying someone’s love and affection? “Money Can’t Buy You Love” is a wonderful example of what new jack swing was in the 90’s. It’s smooth, slick, meaningful, and catchy. The song might make you want to listen to it over and over. Or, just sing the lyrics out loud at random moments like walking to work. I know I have. Ahhh, the 90’s and boy bands. How they go hand-to-hand. Following on the success of boybands of the late 1980s like New Kids on the Block and New Edition, Troop was formed in hopes to blend the two with its popish R&B sound called “new jack swing”. Troop formed in 1987 with five members” Steve “Random” Russell, Allen McNeil, John Harreld, Rodney Benford, and Reggie Warren. They released their self-titled album in 1988, which reached #17 on the R&B album charts. Their debut single “Mamacita” debuted at the #2 spot on the R&B single charts. 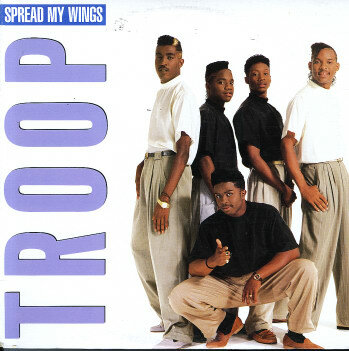 However, Troop didn’t get their first number one until early spring of 1990 with the single “Spread My Wings”. The band is sort of active these days; they got back together in 2004 and then in 2006. Some of the members have decided to focus primarily on their solo careers. You might recognize Steve Russell as he produces songs for various artists like Jordin Sparks, Chris Brown, and etc. Do you remember “No Air” by Jordin Sparks or “Invisible” by Jennifer Hudson? He wrote those. He also sings on various motion picture soundtracks like “Dreamgirls”. He and Allen McNeil released their debut albums in 2011. McNell also acts but hasn’t been in any TV shows or movies yet. It is uncertain if John Harreld, Rodney Benford, and Reggie Warren all have careers in the music/entertainment industry as the internet doesn’t have much information on them. “Spread My Wings” is a song that was composed on the veins of anything produced by Babyface, Bobby Brown, Bruce Hornsby and The Range, and Chuckii Baker. Don’t let the suave vocals convince you other wise. The song is heavily influenced by the new jack style, that was popular in the 90s, by the heavy use of the drum kit, the good old piano, and the way the vocals are handle. Unlike how the official music video portrays it, this song is not really a dance song. I won’t dance to this song with those moves shown in the video. No way! But, “Spread My Wings” is more like an easy listening song that you could listen while you go on a drive, just surfing the internet, or doing chores. The feel good attitude of “Spread My Wings” won’t put you to sleep for sure. More information on Troop can be found here.